Well, at least one winner 🙂 Before anything else let me thank all the participants of my BLOG ANNIVERSARY contest! 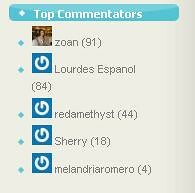 I received a total of 20 entries and many, many comments, especially from two contenders, Lucky Zoan and Lourdes Espanol. I hope you enjoyed rummaging through my archives. With regards to the raffle entries and point, I’m still collating points so please be patient with me. I want to be sure I give you complete credit for your tweets and shout-outs! This entry was posted on Sunday, June 6th, 2010 at 6:08 pm	and is filed under Announcements, contests. You can follow any responses to this entry through the RSS 2.0 feed. You can leave a response, or trackback from your own site. will do 🙂 isasabay-sabay ko na as soon as i get the final list of winners! thanks again for the support mommy! congratulations sa winners and more power to this blog! congrats sa winners! wohoo. galing mo zoan.